Musicians are faced with many choices these days when it comes to choosing keyboards. There are pros and cons to both traditional and digital keyboards. How do you know which one is right for you? Traditional pianos have 88 keys; with their rich and full tone qualities, they are a great way to develop the budding musician's ear. The keys of traditional pianos have a certain weighted feel and are touch-sensitive, which means that the harder you press the key, the louder the sound. 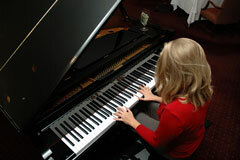 If you plan to play traditional, classical melodies, a traditional piano is most likely the way to go. Traditional pianos are available in spinet, upright, baby grand, and grand models. It is worth noting that the strings on a baby grand are shorter than those on the other models, which affects sound. If you don't have room for a grand sized piano, you might be better off with an upright piano. Pianos, and other traditional keyboard instruments like the clavichord and the harpsichord, are essentially stringed instruments. 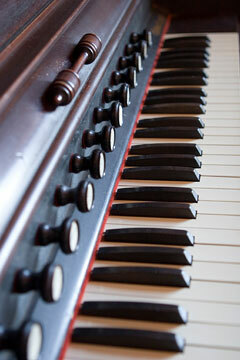 Each key on their keyboards corresponds to a string, or pair of strings, which are housed in the instrument body. These instruments differ in the mechanism which is used to play each string. Other traditional musical keyboards include pipe organs, accordions, and reed organs, which produce sound by means of air-blowing bellows. Pipe organs feature many pipes of various lengths and diameters, through which air is blown to produce a variety of rich sounds. Accordions feature hand-held bellows and a set of reeds which vibrate as the air is blown across them. Reed organs, popular in homes and small churches during the early 20th century, produce sound by pedal-driven or electric bellows which force air across a set of vibrating reeds. Electronic pianos, organs, and synthesizers have become popular during the last 50 years. Featuring a variety of electronically-generated sounds, these instruments are often more portable and less expensive than traditional pianos and organs. 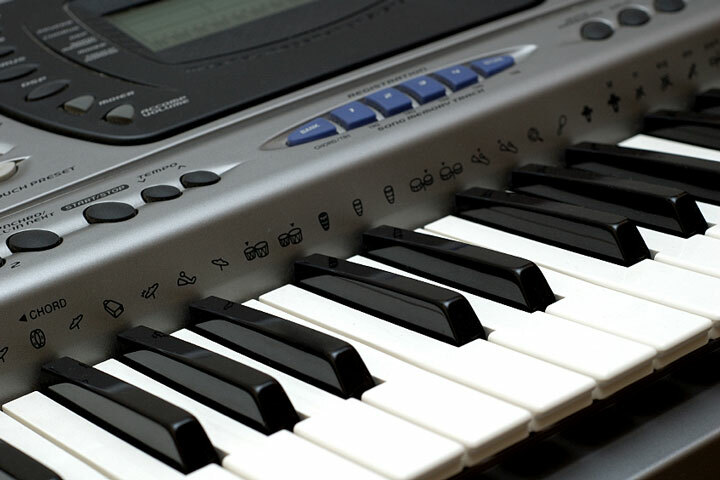 Digital electronic pianos offer a limited repertoire of sounds, but they include sustain pedals as well as keyboards which mimic the weight and action of traditional piano keyboards. Electronic organs can typically generate 10 or 20 different sounds — and combinations thereof. More sophisticated analog synthesizers can generate many different sounds and sound combinations, as well as customized sounds! Digital keyboards use computer technology to simulate the sound of the piano, organ, harpsichord, and a host of other instruments. They are narrower than traditional pianos, usually having between 61 and 88 keys, and the sound is rarely as rich or as full. However, digital keyboards are always in tune, and they are a good choice if portability is important. Digital keyboards also make it fun to explore other sounds, and their features can keep you busy. For example, many digital keyboards allow you to compose your own music, overlay voices, and record your music to CD. Digital keyboards also afford a certain amount of privacy, because they can be hooked up to headphones. Many of the quality models have properly weighted keys, which give them the touch and feel of a traditional piano. Digital synthesizers consist of a piano-style keyboard, a display device, and a microprocessor-based sound generator. This computer module is typically programmed to control each sound's amplitude envelope via a series of push-buttons, rotating knobs, sliders, and switches. Most synthesizers feature internal memory as well as digital MIDI and analog audio interfaces. Amateur grade synths often incorporate a stereo amplifier, dual speakers, multiple rhythm selections, and various prerecorded sound tracks. Professional grade synths generally feature higher quality sounds, more flexible sound customization, enhanced polyphonic capabilities, and data storage devices. Accessories will increase the enjoyment of your digital keyboard. A stand will allow you to adjust the height of your keyboard, and a proper adjustable bench is also a good investment. Headphones, a pedal, and a metronome should complete your keyboard experience.